9 a day plus whole food vitamins provide your body with the nutritional values found in 9 servings of fruits and vegetables. These whole food vitamins are 100% Natural, No Synthetics, and made with with organic fruits & vegetables. This complex blend of vitamins and antioxidants are primarily derived from organic produce picked at the height of their nutrient values. The amino acid chelated minerals facilitate absorption, and the proprietary blend of plant enzymes acts as an efficient delivery system. Together they prepare and distribute the highest quality of nutrients to all the systems of your body. Other key ingredients include essential omega fatty acids that support heart health and 11 strains of probiotics that aid in digestion and strengthening the immune system. First 9 a day plus whole food vitamin box! This is the first look when 9 a day plus vitamins were introduced. The product was in a cardboard box and the capsules all had different ingredients and all looked different they were in packets of 9 capsules. In the video below you will see these images. 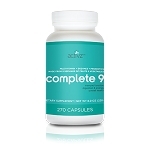 The next version of 9 a day plus the 270 count bottle This is the second version of 9 a day plus more convenient single bottle with 270 capsules all the same ingredients in each capsule so one could take less than 9 per day if they wanted to. This also made the product more available to a younger person to take just a couple a day and get the benefits of this product. 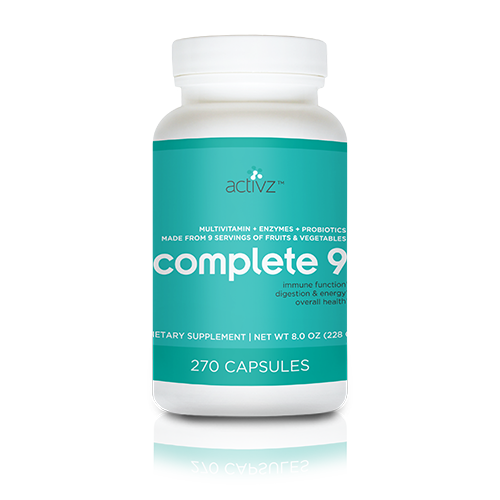 This the the newest version of 9 a day from Activz This is the third version of 9 a day plus still convenient single bottle with 270 capsules all the same ingredient. The company Food For Health International has added several other products under this brand, whole food powders, Silver sol gels and liquids,nutrition bars just to name a few.